A guide that reviews the identification, life cycle, current distribution, and techniques for managing spotted lanternfly on your property. Spotted lanternfly (SLF), Lycorma delicatula, is an invasive planthopper, native to Asia, that was first detected in 2014 in southeastern Pennsylvania. It feeds voraciously on many plants, including economically important crops like fruit trees, grapevines, hops, hardwoods, and ornamentals. If you think you have SLF, do not panic! First, make sure the insect you are seeing is the spotted lanternfly. Second, learn about its life cycle and habits. Third, determine what plants it is infesting and what it is not. Fourth, employ management strategies at the proper time of the year. There is one generation of SLF per year. The eggs are laid in the fall and hatch in the spring. Egg masses are laid on hard surfaces (trees, decks, houses, outdoor equipment, rocks, etc.) and protected with a mud-like covering. Each egg mass contains 30–50 eggs. After hatching and before reaching adulthood, SLF goes through four nymph stages. Nymphs are small (⅛ to ½ inch) and can be hard to find. The first three stages (instars) are all black with white spots, and the last instar is red with white dots and black stripes (Figure 1). SLF adults emerge in July and are active until winter. This is the most obvious and easily detectable stage because they are large (~1 inch) and highly mobile. Adults have black bodies with brightly colored wings. Only the adults can fly. Because SLF adults jump more than fly, their wings often remain closed. SLF wings are gray with black spots, and the tips of the wings are black with gray veins. SLF is a destructive invasive pest, threatening agricultural, timber, and ornamental industries, and the plants in your backyard. SLF is currently under quarantine in 14 counties in Pennsylvania. SLF does not bite or sting. Stop the spread of SLF by checking your car and any outdoor equipment (grills, mowers, firewood, etc.) when going in and out of the quarantine zone. Manage SLF on your property by scraping eggs, banding trees, removing the favored host (tree-of-heaven), and using chemical control when appropriate. Figure 1. The life stages of SLF, including an egg mass on a tree. An SLF quarantine is currently in effect for 14 counties in Pennsylvania (Figure 2). If you find a spotted lanternfly, kill it and report it immediately with our online reporting system or by calling 1-888-4BAD-FLY (1-888-422-3359). Figure 2. The distribution as of March 18, 2019, of SLF in Pennsylvania, indicated in blue. Check the Pennsylvania Department of Agriculture’s website for updated distribution information. SLF is capable of causing serious damage to its host, including oozing sap from the trees, wilting, leaf curling, and tree dieback. SLF feeds using a piercing-sucking mouthpart tapped into the plant like a straw. When SLF feeds, it also excretes honeydew, or sugary water. This creates a sugary surface on and around plants that encourages the growth of black sooty mold. This mold is harmless to people but can cause damage to the plant. If you see black sooty mold or sticky areas on a plant or tree, it may be infested by SLF, but it could also be aphids, leafhoppers, planthoppers, or scale insects. Therefore, it is important to identify the cause of the mold, as control measures may differ for pests other than SLF. There is no way to prevent SLF from moving onto your property. Be aware that SLF is very mobile and management actions must be continuous to keep them controlled. When you travel in and out of the quarantine zone, check your car and outdoor equipment (grills, outdoor furniture, landscaping supplies, mowers, etc.). Check for SLF egg masses from late fall to early spring. Remember that egg masses may be underneath your car or in your wheel well. During all other times of the year, check for nymphs and adults, and keep your windows rolled up when you park. Don’t store things or park under infested trees, and don’t move firewood. Walk around your property to check for egg masses on trees, cement blocks, rocks, and any other hard surface. If you find egg masses on your property from September to May, you can scrape them off using a plastic card or putty knife (Figure 3). Scrape them into a bag or container filled with rubbing alcohol or hand sanitizer and keep them in this solution permanently. Egg masses can also be smashed or burned. Remember that some eggs will be laid at the tops of trees and may not be possible to reach. When the nymphs first hatch, they will walk up the trees to feed on the softer new growth of the plant. Take advantage of this behavior by wrapping tree trunks in sticky tape and trapping the nymphs. Any tree can be banded, but we recommend only banding trees where SLF are abundant (Figure 4). Tape may be purchased online or from your local garden center. Push pins can be used to secure the band. While some bands may catch adults, banding trees is most effective for nymphs. Be advised that birds and small mammals stuck to the tape, while rare, have been reported. To avoid this, you can cage your sticky bands in wire or fencing material wrapped around the tree. Alternately, try reducing the width of the band, so that less surface area is exposed to birds and other mammals. Both of these methods will still capture SLF effectively. Check and change traps at least every other week (or more often in highly infested areas). Tree-of-heaven (Ailanthus altissima) is an invasive plant, but it is common in landscape plantings and disturbed areas, such as along the sides of roads.This is the preferred host for SLF, and current management efforts are focused on removing this tree. Apply herbicide to the tree from July to September and wait at least 30 days before removing the tree. Failure to apply herbicide will result in new growth from the stump; even when treated, multiple applications may be necessary over time to completely kill the tree. These trees can get very tall, so seek the help of a tree care service if necessary. Tree-of-heaven is named because of its rapid growth; it can reach up to 100 feet tall and 6 feet in diameter. The bark of tree-of-heaven is similar to the outside of a cantaloupe. When crushed, the leaves put off a foul odor that many describe as rotten peanut butter. They spread by seed and will also produce “clones” by their roots. This tree can be mistaken for other native species, including black walnut, hickory, and staghorn sumac. For help identifying and treating this plant, visit the Penn State Extension spotted lanternfly website. While tree-of-heaven is a preferred host, SLF feeds on a large variety of plants, including many of the trees in your backyard. Removing these may not be preferred; refer to the next section for further guidance. Only use insecticides that are registered by the Environmental Protection Agency (EPA) to treat any insect on your property. All EPA-registered insecticides have an EPA registration number and a label for appropriate and legal use. Home remedies should not be used against spotted lanternfly because they may be unsafe to humans, pets, and plants and could be illegal. Insecticides can kill insect pests on contact and/or by being present systemically in a plant that the insect pests eat. The duration of control that remains after application (i.e., residual activity) varies depending on which type of insecticide is used. Contact insecticides kill SLF when the chemical contacts the insect as a direct spray or when the insect walks over a surface with insecticide residue on it. Systemic insecticides are absorbed by tree roots, bark, or leaves and are moved through its vascular system to other parts of the tree. When systemic insecticides are used, SLF is killed as it feeds on any part of the tree, even if it was not sprayed directly (e.g., spraying the lower part of the tree will protect the tree tops). Systemic insecticides work best when applied from July-September. However, systemics can also be applied at other times of year, depending on the application method. For example, a soil drench should be applied earlier in the summer. There are four main methods to apply insecticides: tree injection (applied by professional applicators), bark sprays, soil drenches, and direct sprays (can be applied by homeowners). The Pennsylvania Department of Agriculture and the U.S. Department of Agriculture are currently using the systemic insecticide dinotefuran as bark sprays on tree-of-heaven to kill SLF. Systemic insecticides can work well and have residual activity that lasts from several weeks to several months. Property owners should consider hiring a certified pesticide applicator to make insecticide applications. Professional applicators have specialized training and equipment to treat trees. Hiring a professional may reduce your risk of pesticide exposure and save time, but it may cost more than doing the application yourself. Note: The listing of products in this table is not an endorsement or specific recommendation of the product or the company. Other products with the same active ingredient should also work in the same way, but they may have different rates or formulations. Some insecticides available at your local garden or hardware store can be used as soil drenches, bark sprays, or direct sprays. 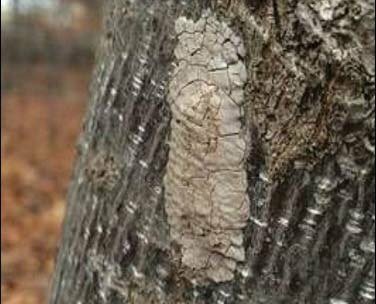 Direct sprays of contact insecticides are applied to surfaces where SLF feeds and walks, which can include the base of a tree, such as tree-of-heaven, where spotted lanternflies are abundant. They can also be applied directly to SLF nymphs and adults. Systemic insecticides can be applied using any of the methods above, but keep in mind that systemics take time to move into the tree. Systemic pesticides should only be applied to trees actively growing, so they should not be applied in late fall or winter. You may apply systemic insecticides using a soil drench around the base of the tree, as a bark spray on the trunk of the tree, or as a direct spray on the leaves of the tree. Systemic insecticides can also be injected into a tree, but this requires special equipment by tree care professionals. Bark sprays have been shown to work well for SLF control, but some of these products also require being mixed with a penetrant, which allows the insecticide to penetrate the bark and move into the tree. There are penetrants available to homeowners, including Pentra-Bark. You must read the label of the insecticide you purchase to determine whether it should be used as a soil drench, bark spray, or direct spray. Soil drenches of systemic insecticides are applied into the soil around the trunk of the tree. The insecticide is taken up by the roots and moved into the rest of the tree. Ideally, soil drenches work best when applied in the early summer to trees that had high SLF populations in the past and are likely to have them again. To protect pollinators, soil drenches of systemic insecticides should be applied after a tree’s flowers have faded. Soil drenches and bark sprays may take several days or weeks to move within the entire tree, so you should not expect immediate results, as with contact sprays. Depending on the product and rates used, soil drenches, bark sprays, and injections have the advantage of longer residual activity (several weeks to several months) over contact insecticide applications. In the table on the previous page, the name of the product is listed, along with the mode of exposure, legal use, activity ranking against SLF, and residual activity (how long it stays active). Specific products listed are not an endorsement. Please note that most currently available products are not registered for use on SLF. It is legal to use them as long as you follow the label instructions, but these products and/or their manufacturers are not liable for results when used against SLF. Research is ongoing to identify the insecticides that are most effective on SLF while posing the least risk to humans, pets, beneficial insects, and the environment. Additional field trials are being conducted to test the efficacy and residual activity of a wider range of the insecticides that are available to homeowners. We have not yet evaluated nontarget effects of listed insecticides on beneficial insects, including pollinators. We do not recommend treating your entire property since these insecticides are not specific to SLF and beneficial insects may be affected as well. Only treat areas where SLF is abundant. These recommendations are current as of March 18, 2019, and may change as we learn more. We encourage you to stay up to date by visiting our website. Check the version of this fact sheet and always look for the most up-to-date information. When using any pesticide, follow the pesticide label for directions, application rates, methods, and appropriate protective equipment. Prepared by Heather Leach, spotted lanternfly extension associate; David Biddinger, tree fruit research entomologist and research professor; and Greg Krawczyk, extension tree fruit entomologist and research professor. This fact sheet was produced by Penn State Extension in collaboration with the Pennsylvania Department of Agriculture and the United States Department of Agriculture.